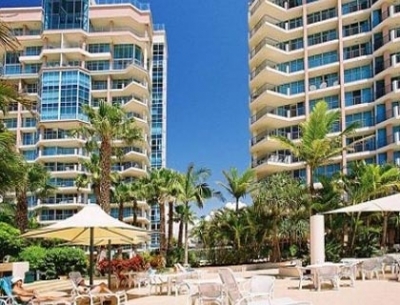 Oceana Broadbeach with fully self contained 1,2,3 bedroom apartments with stunning views of the ocean in Broadbeach and close proximity to the best locations on the Gold Coast. Oceana on Broadbeach apartment complex is ideal for those seeking a relaxing holiday where all the happenings are just around the corner. The apartments are just beside the beach, and the property itself has complete facilities to make your stay at the Broadbeach worth the while. Oceana on Broadbeach is located at 100 Old Burleigh Road in Broadbeach, Queensland. It is just 15 minutes away from Jupiters Casino. All theme parks and the Hinterland tours are within easy access. Championship golf courses are nearby, as well as clubs like the Broadbeach Life Club and the Kurrawa Surf Club.